in using digital tools like augmented reality. Richmond-based CapTech, an IT management consulting firm, strives to provide clients with new technological tools that help them stay competitive. Using new technologies, he says, clients can build brand affinity and customer engagement. These digital tools involve concepts such as blockchain, machine learning, artificial intelligence, augmented reality and natural language processing (NLP), the technology used in virtual assistants such as Amazon’s Alexa. Companies come to CapTech for help in providing “a frictionless customer experience,” McQueen says. Those clients include some of America’s largest companies and government agencies. On the list are 12 Fortune 50 corporations, three of the world’s top five hotel chains, three of the five biggest U.S. banks and 12 state governments. “We predominately work with Fortune 500 and Fortune 1000 companies,” McQueen says. Founded in 1997 by Sandy Williamson and Slaughter Fitz-Hugh, CapTech has more than 900 employees working in 10 offices throughout the U.S. The company has been ranked on the Inc. 5000 list of the nation’s fastest-growing companies 11 times. Fewer than one half of 1 percent of Inc. honorees make the list more than 10 times. CapTech was ranked No. 4,328 on the 2017 list released last August with a three-year growth rate (2014-16) of 59.9 percent. Last year, the company had revenue of $158 million. CapTech helps clients plot their digital future. 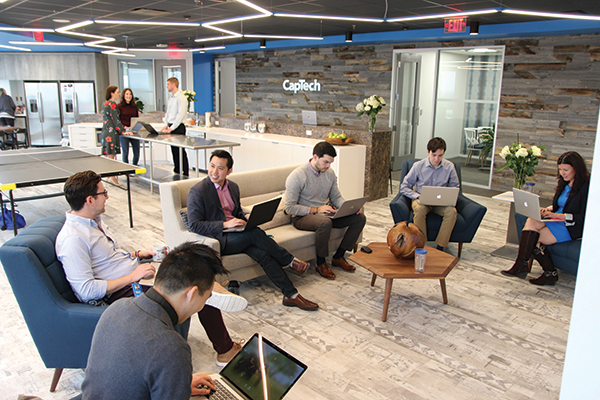 “We talk to them about things we are best at and things we believe in investing in,” says Vinnie Schoenfelder, CapTech’s chief technology officer. One of those emerging digital fields is augmented reality, in which digital objects are imposed on real space. One widely known example of the concept is the yellow-stripe first-down marker seen in televised football games. CapTech officials say augmented reality can give clients the opportunity to test possible scenarios before projects begin. For instance, in looking at vacant lots in a neighborhood, clients could use an iPad to put a digital house on a plot of land. With augmented reality, the client then can walk inside the house and look around. The company also is coming up with solutions that connect natural language processing with data science. For example, users could ask a virtual assistant such as Alexa to make recommendations for dinner reservations based on their tastes. “Integrating data and data science enables convenience and insight interactions,” says Schoenfelder.